Last week when I shared about making Pumpkin Butter, I forgot to tell y'all about roasted pumpkin seeds!!! Once you have cleaned out the inside of your pumpkin, place all the insides of the pumpkin (pulp and seeds) in a collander and rinse them well. The seeds will still be sticky, but that's okay. 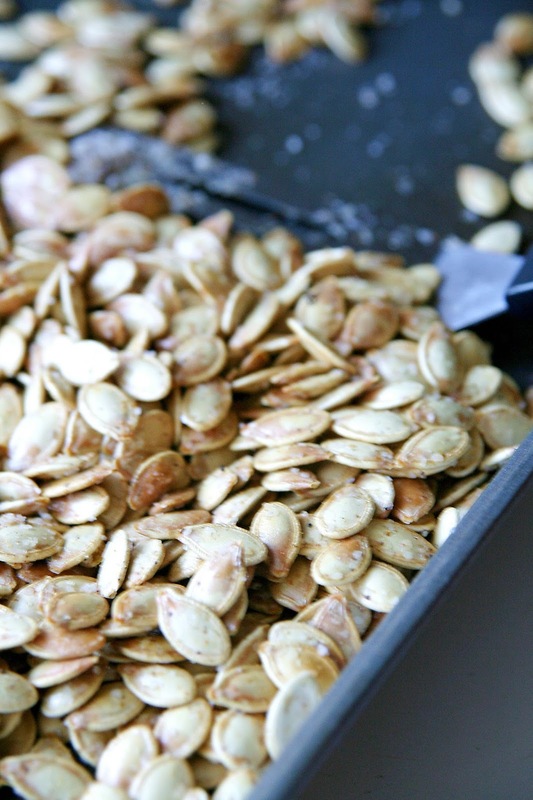 Place the seeds on a cookie sheet and leave them alone for about 24 hours to dry. Do NOT put the seeds on a paper towel (trust me on this) because they will STICK LIKE CRAZY!! Just let them sit on the cookie sheet and they will be nice and dry the next day. The following day, I drizzled them with some olive oil and sprinkled them with some salt and tossed them around to coat each seed. Bake the seeds in a 325 degree oven for about 35 minutes, until they are toasty brown and make sure that you stir them around every 10 minutes or so to make sure they brown pretty evenly. Once they came out of the oven, I sprinkled a little garlic powder and seasoning salt on them and BOY were these tasty!!! I stored these in an air-tight container and they stayed crispy for about 5 days. I will definitely make these again!! I'll have to try adding the extra seasoning after they are done next time. Yum! Oh yummy! I will have to give that a try.